Thought you might like this image. This was observed in a production and testing facility I inspected for safety issues. It was located over a sink where they would plug the device into a 110v / 15 amp outlet. We use something like that all the time in our maintenance shop to test and repair all sorts of equipment at the work bench. If it was actually to be used at the sink, that sounds like a bad plan but when we use them, it's no more or less dangerous than sticking your meter's test leads into a 480V panel to check for voltage. I'm sure this wasn't something intended as a permanent power source but as a piece of test equipment. Slang: Cheater Cord. But all-black boots? 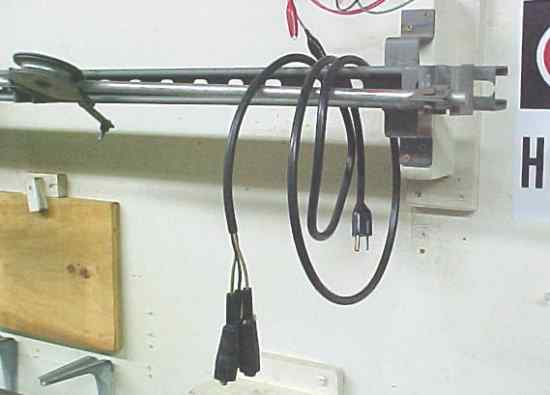 I have one of those hanging near my bench, too, as does just about every other electronics tech I have ever worked with. The cord with alligator clips on it was usually called a "suicide cord", to distinguish it from a "cheater cord" which was a cord with a 2 pin connector on the end used to power up an older TV set with the back removed (before they started soldering the cord right to the PC board). Yes, they can be a very dangerous device in untrained hands, and are probably not OSHA compliant either. And color coding the clips (black/white/green) is a good idea, too! Actually, I have built two of these things, which I regularly use for servicing sound equipment and stage lighting dimmers and spotlights (along with an autotransformer for regulating line voltage and a custom-built GFCI box). One cord is equipped with small clips, owing to the tight working space on some types of equipment. I have not been able to find different colored rubber boots (other than red), so I use red for the ungrounded conductor, and black for the grounded conductor (neutral) and the chassis ground. Beside being able to see the insulation color on each conductor, I also use white and green tape on the black boots. I've been using these for quite a few years with excellent results, aside from occasionally having to replace the wire when the rubber insulation starts to turn hard and brittle...a common occurrence down here on the coast. Using a device such as this (or any kind of electrical equipment) near a sink really opens up a can of worms. I use leads similar to this (but with a British plug) on my electronics workbench quite regularly -- e.g. to temporarily apply power to a transformer to test secondary voltages, etc. before it's wired into a circuit. Fine if used properly by someone who knows what he's doing, but obviously I wouldn't recommend it to the average person.